Barbeques are a beloved summer pastime. But over the past several years, the traditional barbeque unit has undergone significant changes. With today’s innovations, every feature of indoor ranges are now available for outdoor kitchens, too. From cooking components, to cabinets and countertops, the options are endless. With every possibility, you can cook, dine and entertain, months after summer has ended. At Topaz Design, we create customized outdoor kitchens that are tailored toward each homeowner’s specific needs. These kitchens can include anything from grills and refrigerators, to pizza ovens. At Topaz, we help you design your kitchen under the notion that the options are infinite. As part of the design process, we will discuss which features and elements are most important to you. We will then take traffic and other design features into consideration to place your outdoor kitchen in the perfect spot for cooking, entertaining and maintaining convenient access into your home. Whether you want your outdoor kitchen next to your outdoor fire feature or outdoor bar, our experienced designers know how to arrange these amenities in the most appealing and functional way possible. Covering every minute detail, Topaz Design takes care of everything to ensure that your outdoor kitchen will be installed properly the first time around. Using the most innovative and highest quality materials, our years of experience in designing and installing these outdoor spaces has left our team to conclude that outdoor kitchens are one of the most requested and desired features. 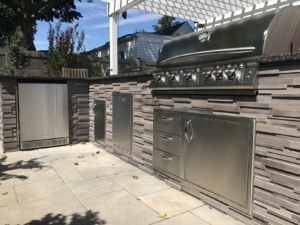 See for yourself some of the stunning outdoor kitchens that we have been privileged to design for homeowners in the Long Island area. Whether you are a passionate cook or a weekend barbeque enthusiast, an outdoor kitchen provides you with ample space to show off your skills and creativity. With this backyard enhancement, you can prepare every masterpiece imaginable, without ever having to leave your outdoor escape. To get started with your outdoor kitchen project, complete our online form today.